For much of its running time, Mike Leigh's latest feels less like a single narrative than a series of shorts connected by location and a shared cast of characters. He divides the film into sections determined by the seasons, and each season shapes the tone and emotions of the story. 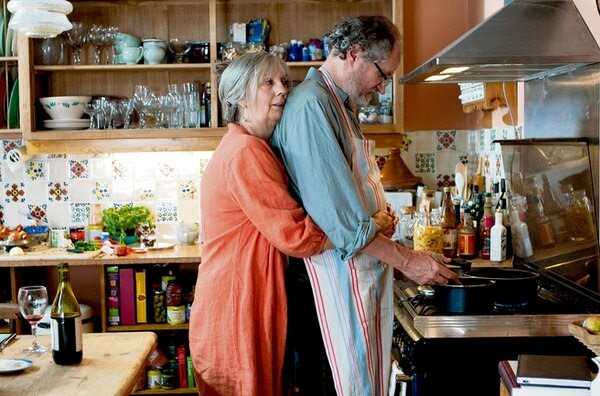 Starting in Spring, it shows a year in the lives of Tom and Gerri (Jim Broadbent and Ruth Sheen), a middle-aged, middle-class couple living in London. Tom and Gerri are happy, contented people, the sort of couple who have been together for decades and will probably see out their days in each others' loving embrace. Happily married couples may be heartwarming, but they aren't often the basis of great drama. That comes in the form of their friend Mary (Lesley Manville), who works as a receptionist at the same hospital where Gerri works as a therapist. Mary is a borderline alcoholic who nurses her drinks the same way that she nurses a sweetly pathetic crush on Tom and Gerri's son, Joe (Oliver Maltman), and in the first three sections of the film she provides the catalyst for the little crises that tax Tom and Gerri. In Spring, she spends the night eating and talking with them and eventually passes out in Joe's room, bemoaning the state of her life and how sharply it contrasts with the happiness of her friends. In Summer, she moons over Joe at a barbecue whilst spurning the advances of Tom's old friend Ken (Peter Wright), who seems just as messed up and confused as her. In Autumn, she meets Joe's new girlfriend at a small party and winds up making things very unpleasant for everyone involved. Throughout these sections Manville invests Mary with a sadness that her assurances that she is happy with her life barely hide. When watching the film, I couldn't help but think of her as an inverted counterpart to Poppy, the main character of Leigh's previous film Happy-Go-Lucky. Whereas Poppy's ebullience and love for life seemed to come from a genuine place, albeit one founded on an idealistic naivety that suggested that she'd never really had to deal with any hardships to shake her worldview, Mary's claims to being happy can't help but ring false because she has clearly been broken by life. She's been in bad relationships, doesn't have many friends and has hardly any family to call upon. It's this that leads her to attach herself so strongly to Tom, Gerri and Joe, and it's that powerful, misguided love that lends the film much of its drive. Manville makes Mary into much more than the caricature of a drunk that she could have been, and in doing so makes her all the more pitiable because of how painfully real she seems. Apart from Manville's performance, there isn't all that much in the film's first three-quarters that is all that interesting or compelling. It's genial enough, but there isn't much there to warrant the acclaim that film has received. Broadbent and Sheen play their parts with a warm yet forced joviality that, on the one hand, feels very real because you get a sense that they have a long history from their obvious ease in each others' company. On the other, you always feel as if you are on the outside looking in, and this makes them seem pretty smug and, in their attitude towards Mary, condescending and patronising. I don't consider that to be a flaw with the film, since it seems to be at least partially intentional to view them that way, but it does make watching the film feel worryingly akin to being invited to a party where you don't know anyone and everyone keeps making inside jokes that they never explain. This is the tone that defines the first three seasons of the film. In stark contrast to the suffocatingly cordial tone of the first three sections, Winter is suitably cold and bleak, both in tone and its bleached visual style, trading in red, orange and yellow for steely grey. Tom, Gerri and Joe travel to Derby in order to attend a family funeral. In doing so, we are introduce to Tom's brother Ron (David Bradley, whose near-monosyllabic performance turns from hilarious to heartbreaking in the blink of an eye) and, in showing how he and Tom interact, Another Year suddenly reveals the true souls of these characters. We see that they don't just act like good people, they are good people, and the stoicism displayed by Bradley and Broadbent as they try to comfort each other was, for me, genuinely moving, and displayed a gentle, warm humanism that the rest of the film lacked or only hinted at. We tend to be more forgiving of films that end stronger than they began, and I am aware that the extent to which Winter affected me has caused me to look more kindly on Another Year as a whole than I would have if the film had ended after Autumn. Yet I can't ignore the fact that the final half an hour is so starkly beautiful, so sad and achingly human, and ends on such a beguiling note of emotional ambiguity that it really did change my entire perception of the film. It casts the rest of the film in a new light, one that I couldn't help but be won over by.